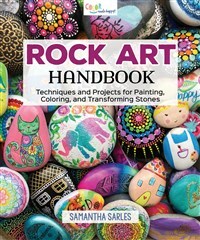 Samantha Sarles is known for painted rocks, colorful and inspiring art, and a rainbow-themed aesthetic. With ten years marketing and branding experience at a Fortune 500 corporation, Sam created her own art and DIY-centered brand after becoming a mom. Since then she has amassed 30,000+ followers on Instagram, where her work has been featured by companies like Starbucks, The Huffington Post, and Michaels Craft Stores. Sam also has 100,000+ followers on Facebook, where her rock doodling video has nearly 2 million views. She blogs at colormadehappy.com.